Sign-up to receive more information on how your salon can help build the Yawanawa Life Plan. 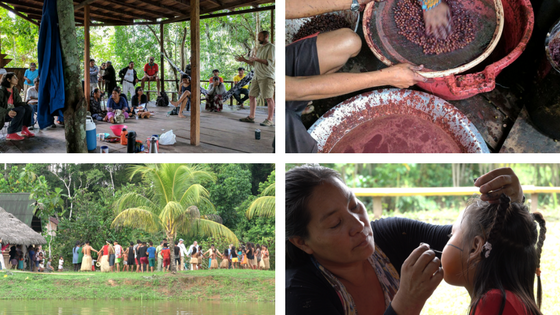 NativeEnergy is creating an exclusive opportunity for members of the Aveda Network to participate in this exciting project that builds on Aveda's long relationship with the Yawanawa people. Soon, Aveda salons and Institutes will be able to help the Yawanawa build and achieve their Life Plan. With an affordable annual commitment Aveda salons will receive regular updates on progress and display materials to help them share this amazing story with their guests. This project, to be launched soon, will fund activities in the Yawanawa Life Plan. Project funding will enable the Yawanawa people to drive ecosystem benefits that fight climate change, deliver clean water, and protect the Yawanawa’s unique spiritual understanding of the forest and the wealth of plants and animals they share their land with. These are benefits that serve the entire world. To receive more information on how your salon can be a part of the Yawanawa Life Plan project, please fill out this form with your information.